It has been a while, but we are back on track with the review of the Impel Trading Cards. Today we arrived at # 22, First Sergeant Conrad “Duke” Hauser. Duke is the field commander and second-in-command of the G.I. Joe team after General Hawk. He was first introduced into the comic in issue #22 (and this is the #22 of the Trading Cards, talk about coincidence). 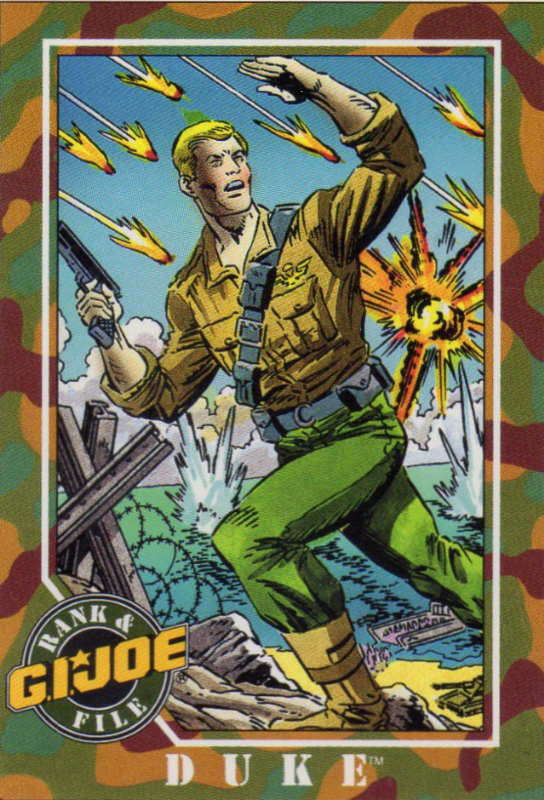 He is introduced alongside Roadblock on the funeral of General Flagg, shooting down a Cobra Rattler. The character has been a love him or hate him character all these years. Even Larry Hama (God for the admirers) admitted not really being able to handle the character. However you feel about the guy, he has played a major role in all of the Joe storylines. In the Marvel run, he keeps on duty till they fold the flag. In the Devil’s Due main comics he takes over active duties from an – spoiler alert – disabled Hawk. In Amera’s Elite, he leads the Joes into the battle against the Plague during World War III. In Reloaded, he gets knifed by Scarlett (Go Red!). 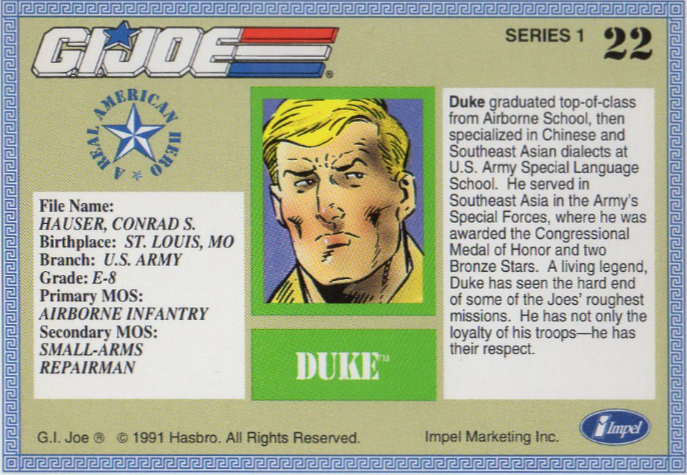 Not only in the comic books, but also on the small and big screen Duke plays a big role in the Joeverse. In the ARAH cartoon, he is field commander for General Flagg and later second-in-command under General Hawk. In the animated movie, he is the older half-brother of Lt. Falcon and should have been killed, but Hasbro intervened and at the end of the movie a small line was added – uttered by Doc I think – to indicate Duke would survive. In Sigma 6 he is the Joe leader. In the Resolute story, he finally gets a shot with Scarlett. During my research I came across some fanfiction that goes deeper into this (I haven’t read them though). In Renegades, he is part of the fugitive band of heroes that fight the Cobra Corporation. This is grittier, darker setting and so is Duke. He even gets a role in Prime Time TV show Community – Episode G.I. Jeff – where he leads a court-martial against the main protagonists of the show alongside Scarlett and Flint. This brief overview again shows that it’s a difficult character for the writers as well. While one depicts him as a hero saving the day and the world, the other might just have him shot in the nuts. Personally, I have nothing against the guy. I thought he was a regular Joe in my toyworld. It wasn’t until I started getting into the comics that I learned he was a big shot. The more recent IDW comics show some more of Duke (having a wife and all that). They’re making him into more of a tragic hero and I think that is fitting for a guy you either love or hate. Basically a good guy, that can do bad things if it means saving someone or something he loves or believes in.